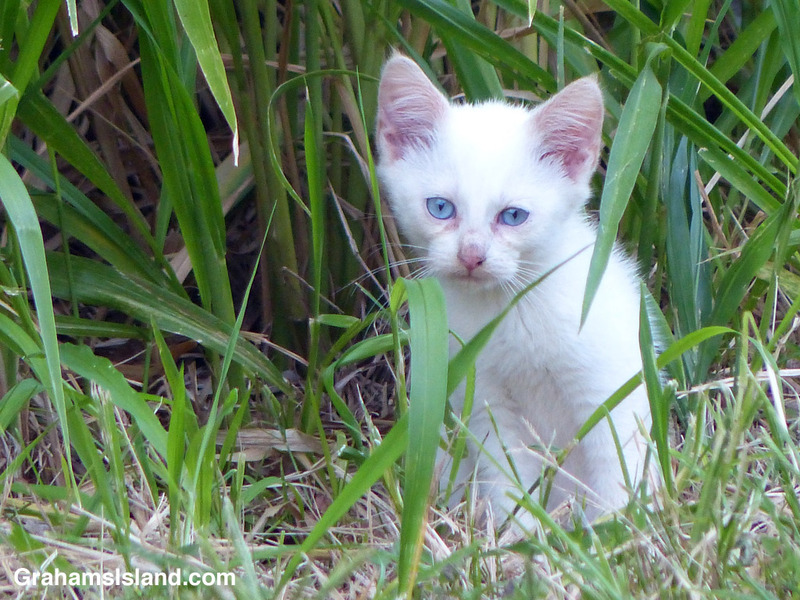 While out walking, I saw three, probably feral, kittens by the side of the road. When they saw me, they promptly rushed into the tall grasses bordering the road. I waited a while and this ghostly kitten duly reemerged, sat down, and fixed me in its icy blue stare. I took a few photos and went to turn off my camera, but it wouldn’t respond. Instead, the screen broke into a display of blue flashes. I had to pop the battery out to end the show. When I put the battery in again and turned the camera on, it worked fine. I looked back at the kitten. It hadn’t moved, still staring. A glitch in the electronics? Or something more sinister? Hmm. Maybe. I haven’t seen it since. Don’t know what that means!